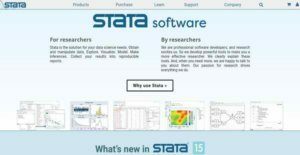 Stata is an intuitive, accurate, and complete data analysis and statistical software solution that makes the lives of researchers much easier regardless of what discipline or field of specialization they belong to, be it behavioral science, education, medical research, education, economics, political science, public policy, sociology, or finance, business, and marketing. Providing all the important tools and features they need, Stata integrates data management, data analysis, data modelling, and graphical visualization all in a single tool. This fast and multi-purpose data analysis and statistical software boasts its wide array of estimation and statistical features that apply both standard and advanced statistical methods and techniques. Stata is also a developer and programmer-friendly solution. It allows users to use and execute commands as they make inferences on their data. As they run these commands and perform analyses, the platform keeps a record of the commands they are using and the sessions they are doing within the solution. Because of this, they will be able to easily replicate whatever analyses they previously conducted and share them with their colleagues. Stata is equipped with robust data management capabilities which enable researchers and business professionals to rapidly capture, consolidate, explore, and present their data so they can come up with meaningful and powerful observations and insights. Last but not least, the software solution simplifies the creation of graphs and other visualizations which are ready to be printed, published, and reproduced. One of the exciting features of Stata is its easy-to-use point-and-click graphical user interface or GUI. This user interface is not just simple and intuitive, but it can also adapt to different types of users, supporting the needs of newbies, experienced researchers, programmers, and advanced or highly-skilled users. Let us examine some of the key components of Stata’s graphical user interface and understand how they function. The GUI is built with menus and dialog boxes. This menu and dialog system allows users to access the features of the solution that are related to data management, data analysis, and statistical analysis. There are three menus that users can access on the GUI, namely, Data, Graphics, and Statistics menu. If they want to utilize a specific feature, all they need to do is to click on one of these menus. For example, if they want perform negative binomial regression, that can be accessed from the Statistics menu. As they click on such menu and make selections, dialog boxes will appear, allowing them to specify the configurations and fill in all the important information needed. As previously mentioned, Stata is a developer and programmer-friendly solution, and that can be observed in its command line features. This set of features enables users to type in commands and run them. In other words, if they want to perform specific analytical, statistical, and other operations, the command line features of the solution permit them to do that. These features are organized into different windows in the graphical user interface. Among those windows is the Command window. This window lets users enter or type in command scripts and syntaxes. After typing in and running the commands, the solution will respond back and show the results in the Results window. Another window is the Review window which shows the list of commands that the solution generated and all those commands that users have typed in. Thus, this is the window where they can track command histories. Stata’s GUI also delivers a set of advanced components that allows users to work more efficiently. One of them is the Data Editor. This component permits them to see a live view of their data as they utilize functions and perform operations. This means they will be able to view how their data changes over time. Another component is the Variable Manager. The Variable Manager is designed for editing large numbers of variables such as modifying their names, labels, notes, and types. Documenting analyses is a powerful feature included in Stata. How does this feature work? The solution automatically records all the commands users are typing in and executing and the responses made by Stata, the interactive sessions they are conducting, and even the changes they made to spreadsheet files. All of these are stored in log files. But what’s the importance of this particular feature? Obviously, it lets users easily review and evaluate all analyses they are performing so they can ensure that they are accurate and error-free. Interestingly, the log files that contain recorded sessions can also be re-run as command scripts or batch files. Because of this, duplicating or replicating data management and analysis activities is made possible. Stata provides data management capabilities that give user full control of data sets, whatever their types are. They can link data sets together and reshape them. They can also painlessly define, edit, and manage variables. If they want to apply statistical analysis to groups of data sets simultaneously and collect statistical results, the solution allows them to do that easily as well. Moreover, Stata is built with tools that can handle special types of data like survival or duration data, panel or longitudinal data, multilevel data, categorical data, multiple-imputation data, and survey data. Generating publication-quality graphs using Stata is a breeze. In fact, users can produce a custom graph by simply pointing and clicking. They can also create graphs through the command line features of the solution. In this case, they need to write and run command scripts to instantly come up with a large number of graphs which they can reproduce for printing, publication, or export purposes. In addition, the graphs can be saved in multiple file formats such as EPS, TIF, PNG, and SVG. If they need to edit a graph, Stata has an integrated graph editor which enables them to customize the appearance of their graphs and modify everything about them like titles, legends, axes, lines, arrows, markers, and annotations. If you are considering Stata it might also be beneficial to investigate other subcategories of Best Data Analytics Software collected in our database of B2B software reviews. Companies have diverse wants and requirements and no software solution can be just right in such a scenario. It is pointless to try to find an ideal out-of-the-box software app that meets all your business requirements. The intelligent thing to do would be to customize the solution for your special requirements, employee skill levels, budget, and other elements. For these reasons, do not rush and pay for well-publicized trendy applications. Though these may be widely used, they may not be the perfect fit for your unique requirements. Do your groundwork, check out each short-listed platform in detail, read a few Stata reviews, call the vendor for clarifications, and finally select the product that presents what you want. How Much Does Stata Cost? Stata offers several SMB and enterprise pricing plans and packages for all users to choose from. The plans can be availed through perpetual or subscription licensing. You can use the software for business, government, nonprofit, or education purposes. Please contact the vendor for more information on all the available licensing options, and ask for a quote. If you are located outside the United States or Canada, you need to keep in touch with a local distributor. Volume licensing is also available. We realize that when you make a decision to buy Data Analytics Software it’s important not only to see how experts evaluate it in their reviews, but also to find out if the real people and companies that buy it are actually satisfied with the product. That’s why we’ve created our behavior-based Customer Satisfaction Algorithm™ that gathers customer reviews, comments and Stata reviews across a wide range of social media sites. The data is then presented in an easy to digest form showing how many people had positive and negative experience with Stata. With that information at hand you should be equipped to make an informed buying decision that you won’t regret. What are Stata pricing details? What integrations are available for Stata? The capabilities of Stata can be incorporated into third-party business applications. In addition, the software is available in three versions, namely, Stata/MP, Stata/SE, and Stata/IC. These versions are compatible with each other, although each version is designed to handle a specific size of data sets and has its own data processing speed. If you need more information about Stata or you simply have a question let us know what you need and we’ll forward your request directly to the vendor.